“Pump Up The Volume” stands as one of the strangest songs ever to chart in America (peaked at #13). The handiwork of British musicians Martyn and Steve Young of Colourbox and A.R. Kane [see our Sept. 5 review of their Up Home! EP], this seven-minute sampladelic collage both entranced and discombobulated dance floors in the late ’80s—as did its four-minute edit to radio listeners. M|A|R|R|S loaded the track with an absurd abundance of sonic information; it’s as overwhelming a listening experience as anything concocted by the Bomb Squad for Public Enemy or the what the Dust Brothers stitched together for the Beastie Boys’ Paul’s Boutique. “Pump Up The Volume” is one of those surreal, action-packed jams that can jolt you out of your doldrums while shopping for cereal at QFC (true story). 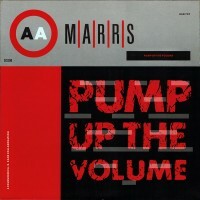 The main rhythm of “Pump Up The Volume” is a rolling, punchy house-music amble, spookily accentuated with heavily FX’d vibraphone tintinnabulation (I think). The excitement level seriously spikes when they bring in the monstrously funky, Moog-/timbale-enhanced break from the Bar-Kays’ “Holy Ghost.” Other elements producer John Fryer zooms in and out of the mix include the oddly riveting chorus from George Kranz’s “Din Daa Daa,” Public Enemy’s Flavor Flav shouting “You’re gonna get yours!” Washington DC go-go group Trouble Funk chanting “pump pump pump me up!” rapper Rakim intoning “Pump up the volume” (of course), a Last Poets member’s rapid-fire rant from “Mean Machine” (“rhythmatic systematic remote control/magnetic genetic commands your soul”), drums and cowbell from Kool & The Gang’s “Jungle Jazz,” and Dunya Yusin’s striking melisma from “Abu Zeluf.” Throw in some scratching by C.J. Mackintosh and you have a recipe for confusion, but the whole thing hangs together splendidly, returning to the original undulating rhythm just when you think it’s going to split at the seams. The US edition of the EP gives you two alternate mixes with slight variations, but both pale before the original epic. The 12-inch’s other highlight is “Anitina (The First Time I See She Dance).” Written by A.R. Kane, “Anitina” is a corrosive slice of the group’s patented, solarized shoegaze, buttressed with a sexily strutting bass line and some pneumatic ’80s drum-machine beats. Rudy Tambala sings to his “little dollies,” “I’ll feed you sugarkane” and “touch me where it’s forbidden,” and the effect is charming rather than creepy due to his vulnerably soulful voice. While “Pump Up The Volume” hogged the lion’s share of the spotlight, “Anitina” is a stunning gem in its own right, one of the most compelling compositions A.R. Kane ever conceived.